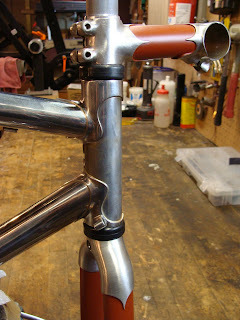 Patrick's frame is another one I'm planning to display at the upcoming NAHBS in Richmond. 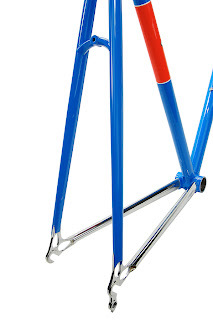 It's a mostly 953 frame with the exception of the seat tube, head tube and a plain steel bottom bracket instead of stainless. 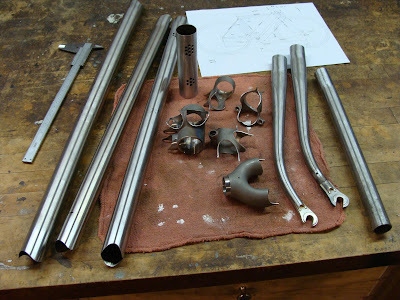 All the stainless will be polished with a painted seat, head tube and fork blades. 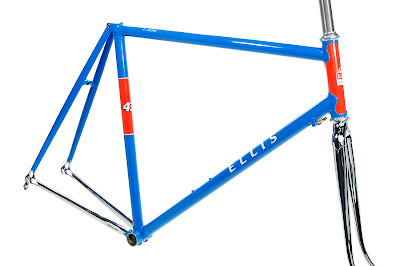 Very similar to the 953 Ellis I built for Mike S. last year. I was hoping to have that one done for the show, but we were held up by a stainless fork crown, this year there shouldn't be any problems. 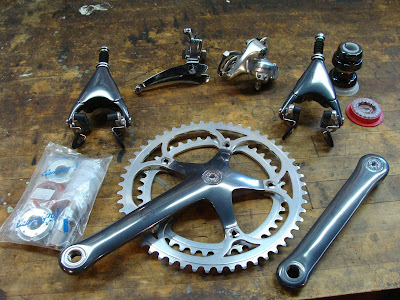 Above, all the parts prepped and ready to for the fixture. 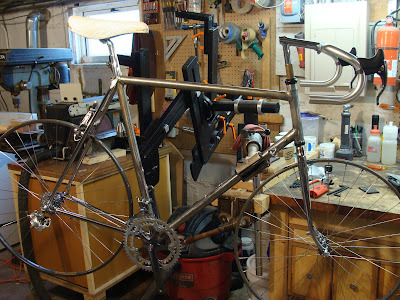 Here I've got the complete bike set up so I can cut the seat stays to length and get the stainless caps welded and finished. 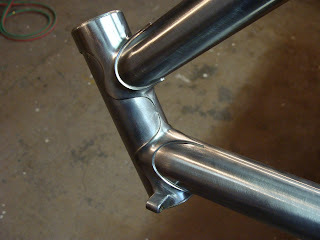 I have to thank the guys at Waterford for helping with that quick bit of stainless welding! 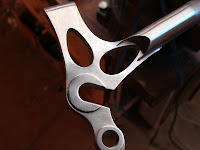 A couple detail shots of the 953 chain stays and my new dropouts. 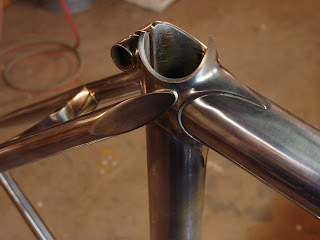 I extended the tabs just a bit so I have more contact area for silver brazing. 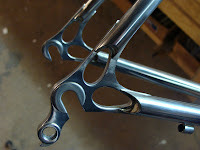 When I prepare the dropouts for a 953 bike, I finish the tabs to a point and then slot my stays to fit that point. 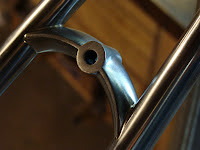 What I'm looking to do is leave the points slightly raised from the stays so when the frame is polished, the silver braze doesn't get undercut around the dropouts. Plus it looks kinda cool too! 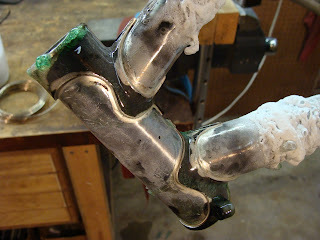 The head lugs after brazing. 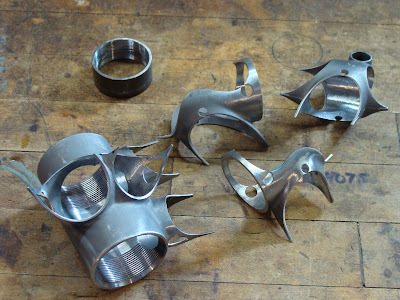 Head lugs after a soak and some finishing. 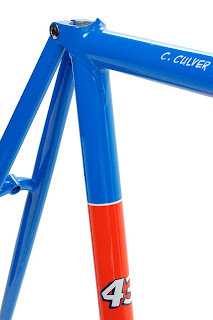 I really like the detail of the points almost touching on the back of the head tube. 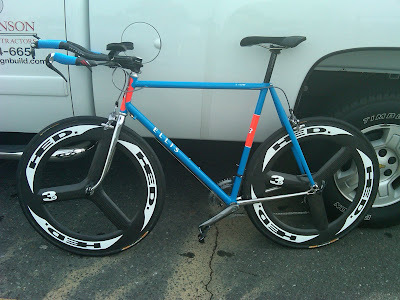 Just a geeky frame builder thing. 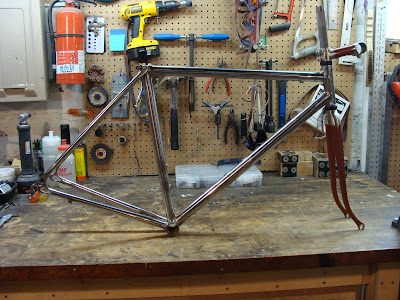 The frame, fork and stem all ready for final polish and then paint. 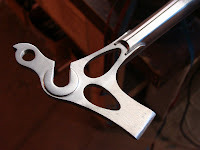 I've started working with Jason to have him prime the fork and stem before polish so the sealer gets right into the lug edges. He'll have to touch things up after polish, but it's been working well, and it makes the polisher a bit more careful of the edges as well. 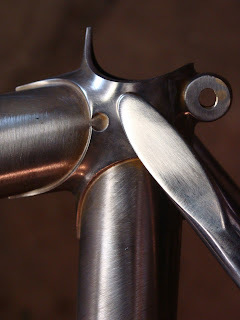 A closer shot of the head lugs, fork crown and stainless lugged stem. 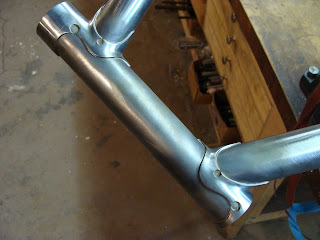 A couple detail shots of the brake bridge, (it really mitered up tight and brazed nicely), and the rear dropouts. 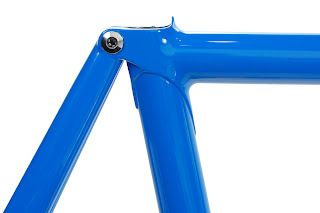 Finally, the seat lug with the side tack 953 seat stays. 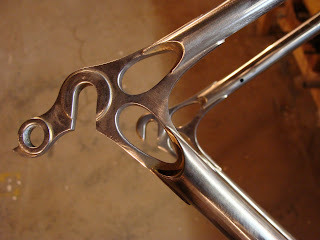 Tomorrow, I'll post some shots of my personal road frame that's also destined for the NAHBS show! Rob certainly didn't waste any time getting his new Christmas present put together. 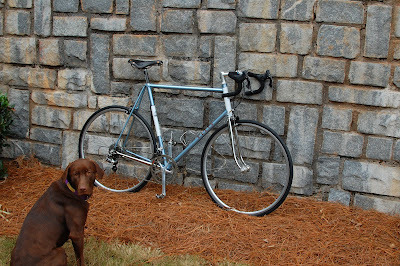 He sent along this photo of the bike and his "inspector". "Looks like everything is where it needs to be!" 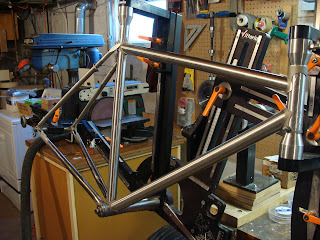 I'm busy working on show frames and bikes for NAHBS, should have some more photos soon!